Zrazy potatoes with meat and sour cream (зразы картофельные с мясом со сметаной) - kinda like stuffed croquetas. Not bad. Porridge (каша) - this was made with barley. 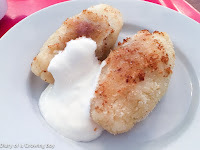 They seem to light to spoon some melted butter on top, so it's somewhere between a little sweet and a little savory. 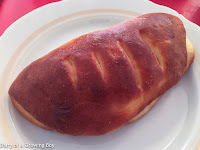 I also had this very dry bread with a very small and thin layer of cheese inside (плюшка сыром). Not a fan. I washed it down with some mixed berry juice drink. 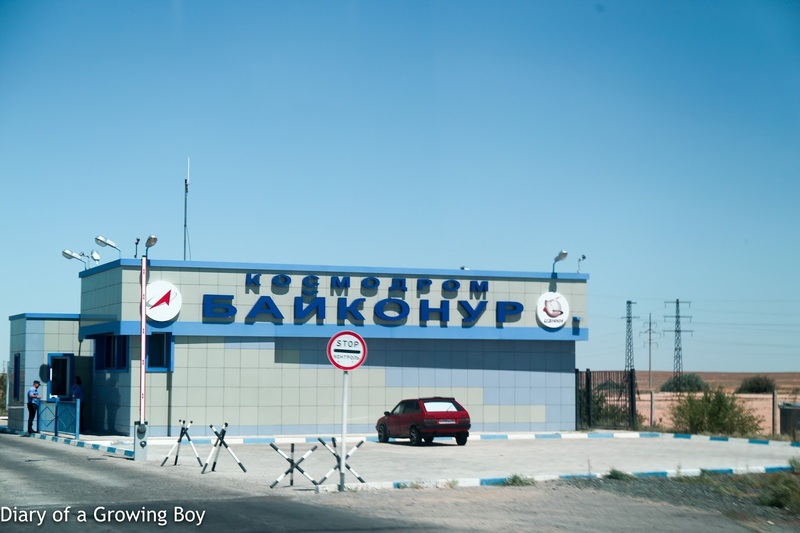 After breakfast we boarded our minibus and started our tour of Baikonur town. 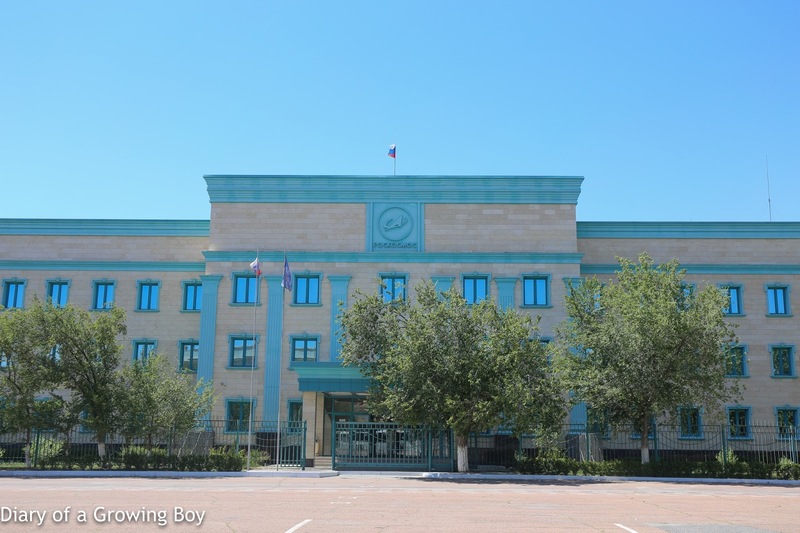 Baikonur complex covers an area of around 6,700 sq. km., and includes both the town as well as the Cosmodrome. This is land that technically belongs to Kazakhstan, but has been rented by the Russian Federation until the year 2050. So it's a Russian concession where even normal Kazakhs will need to apply for permission to enter. About 40% of the population is Russian, and Russian Rubles are used here. Military checkpoints guard the roads leading into the areas. 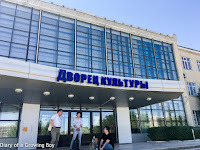 Our first stop was the Palace of Culture (дворец культуры). 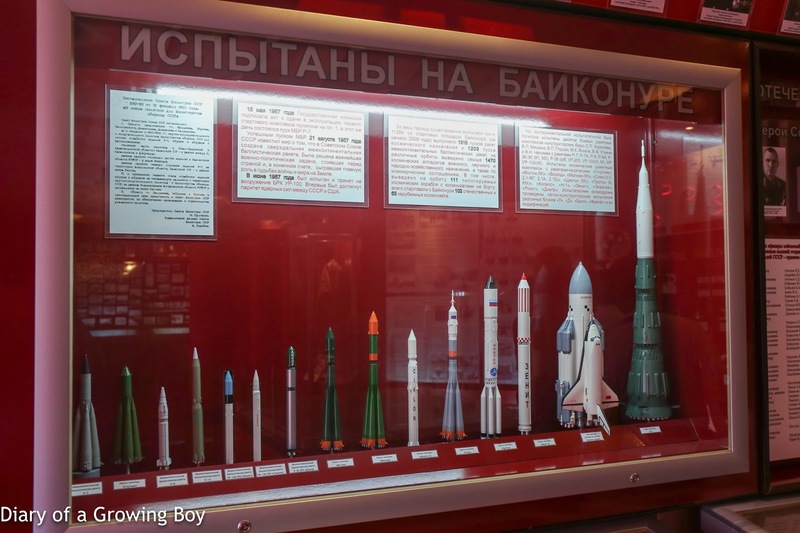 Essentially this is a museum of the history of Baikonur - starting from the time when the Soviets were fighting WWII and started testing ballistic missiles after the end of the war. 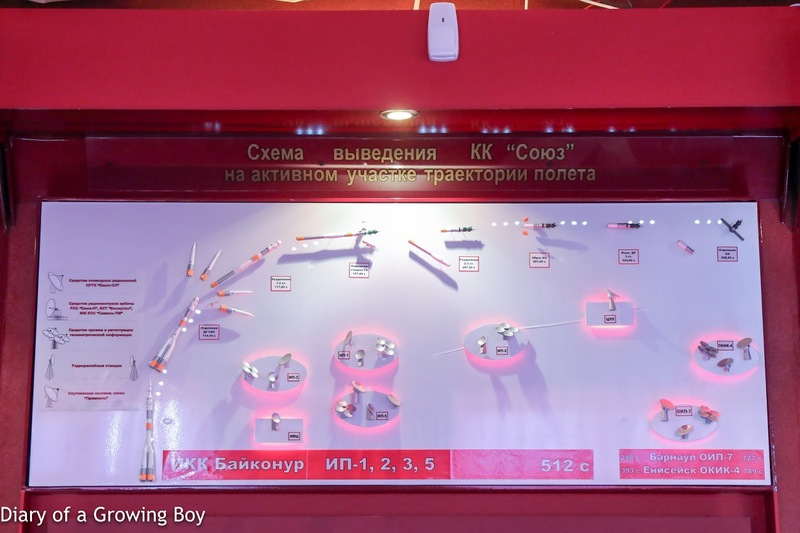 Lots of photographs and models are here, with a comparison of the different rockets launched here, as well as an explanation of the different stages of the Soyuz rocket. We spent a couple of hours here. 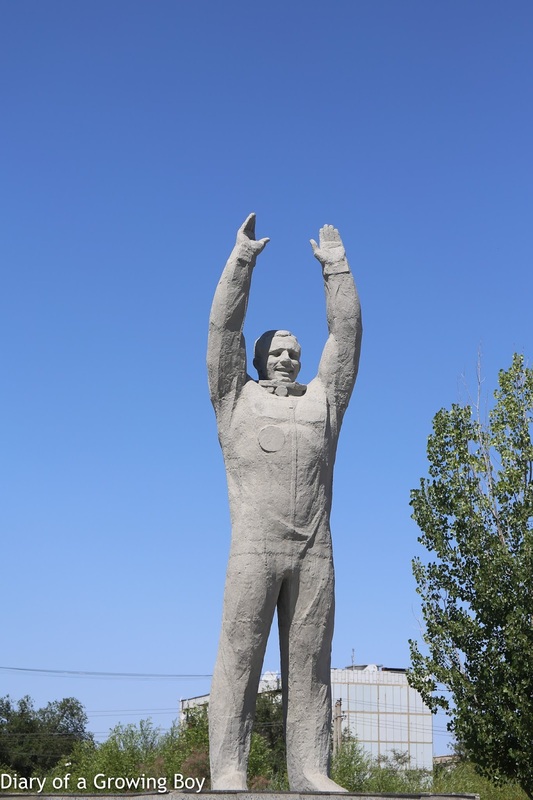 Next stop was the Gagarin Monument. He is positioned so that at a certain time of the day, his would seem to be holding the sun between his hands. Soyuz Monument was next, and here we came face to face with an actual Soyuz rocket. 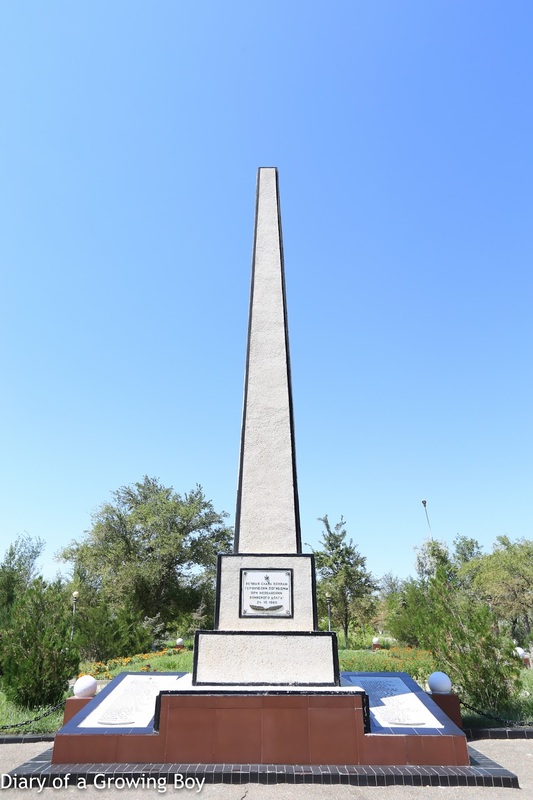 We moved on to the Mikhail Yangel Memorial Park (Памятник М.К. Янгелю). 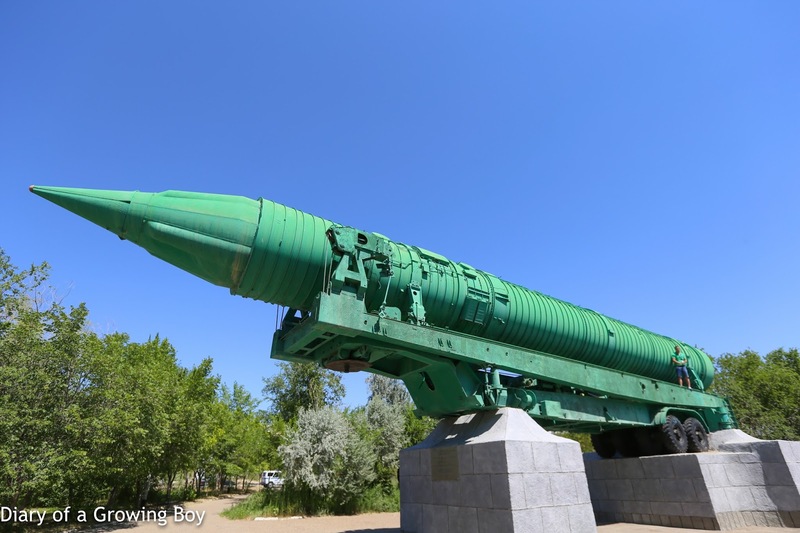 He was a leading designer of ballistic missiles in Soviet times, which explains why there's an SS-17 - hopefully without any warheads - parked here. Another memorial park commemorates those who died in two separate accidents which both happened on October 24th but in different years. The Nedelin disaster on October 24th, 1960 resulted in the death of 74 people, while 8 people were killed three years later in another accident. This park acts as the final resting place for many of the men - most of whom could not be buried whole. There have not been any launches scheduled for October 24th since then. We break for lunch at Звездное небо, and run into other tourists for the first time. According to Anya, there are more than 400 tourists like ourselves who came for this launch - the biggest group ever, with about 150 foreigners. Normally they get about 200 or so. Anyway, a set lunch has been arranged for us. 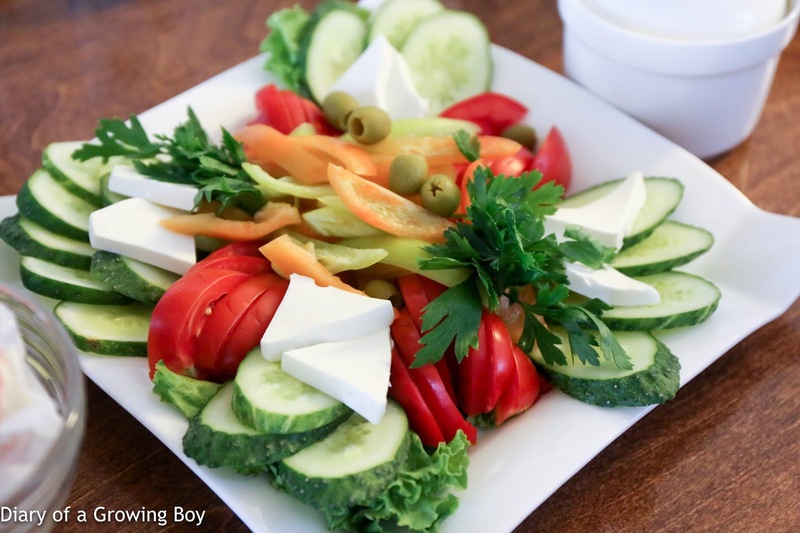 As is typical for this part of the world, we have a "Vegetable with cheese" salad (овощной с сыром) of tomatoes, cucumbers, bell peppers, and some cheese has been added. 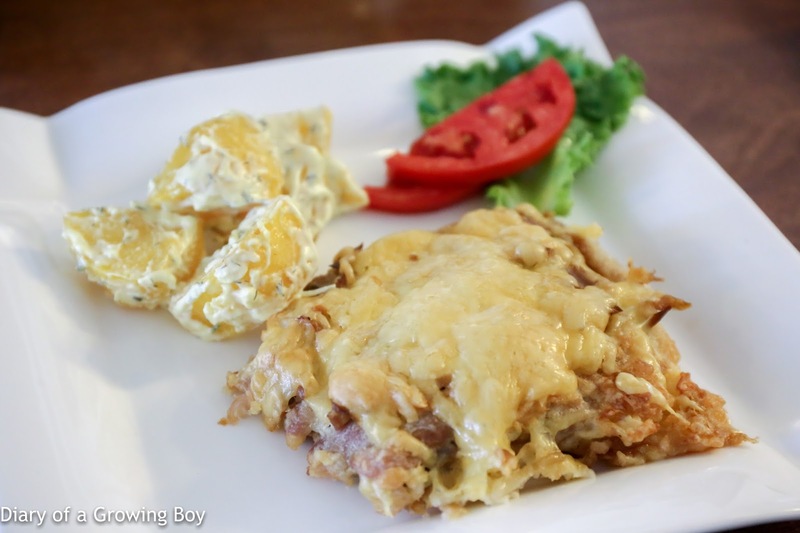 A chop from chicken with mushrooms and cheese (отбивная из курицы с грибами и сыром) - this piece of deep-fried chicken steak was covered with a layer of cheese on top, with slices of mushrooms in between. Not bad. 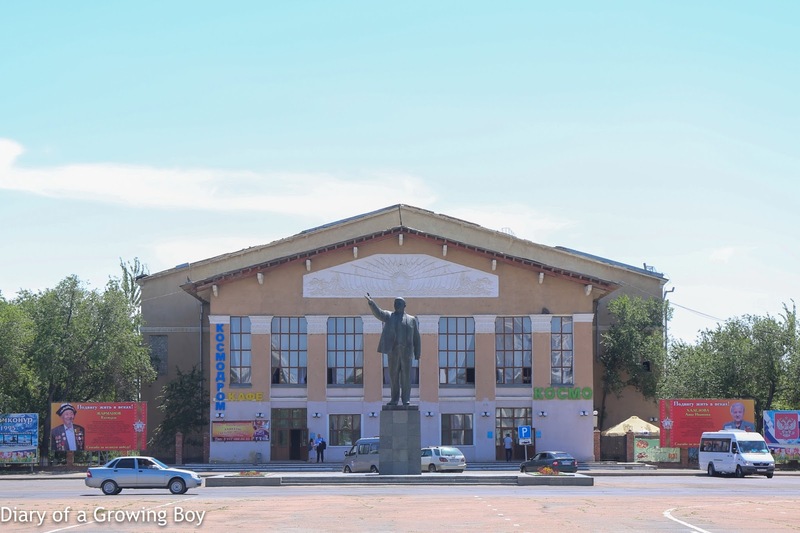 We walked around Korolev Avenue towards the big central square in town. On one side of the square a statue of Lenin still stands. After all, the city was first name Leninsky (Ленинский) and then Leninsk (Ле́нинск) in Soviet days. 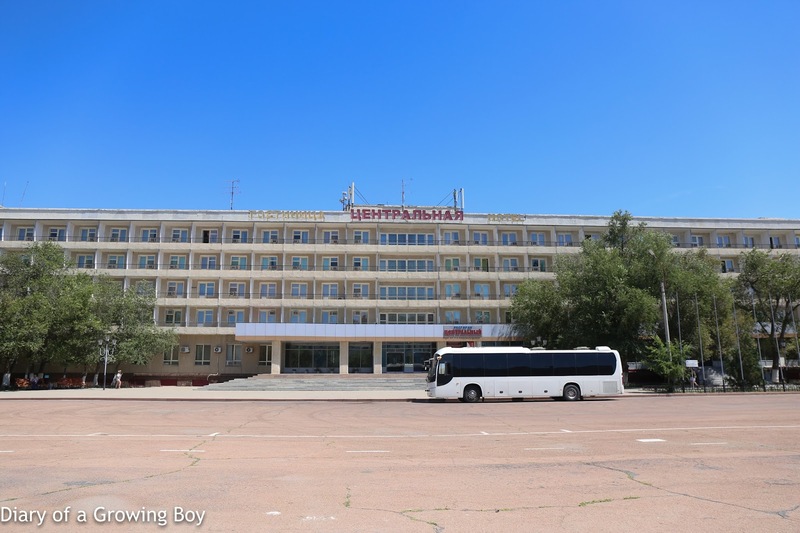 The big Hotel Tsentralnaya (Центральная гостиница) is, apparently, not a great place to stay. But its main advantage is its central location. 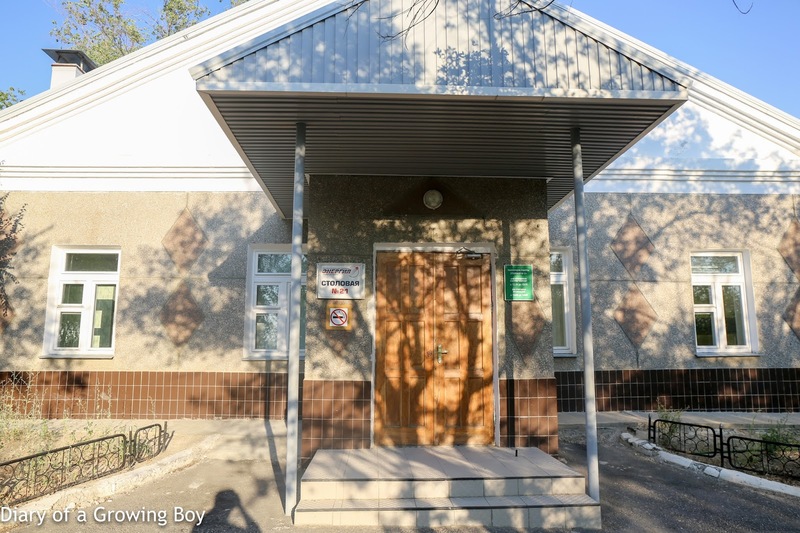 Our main program for the afternoon is a visit to the International Space School (Международная космическая школа). 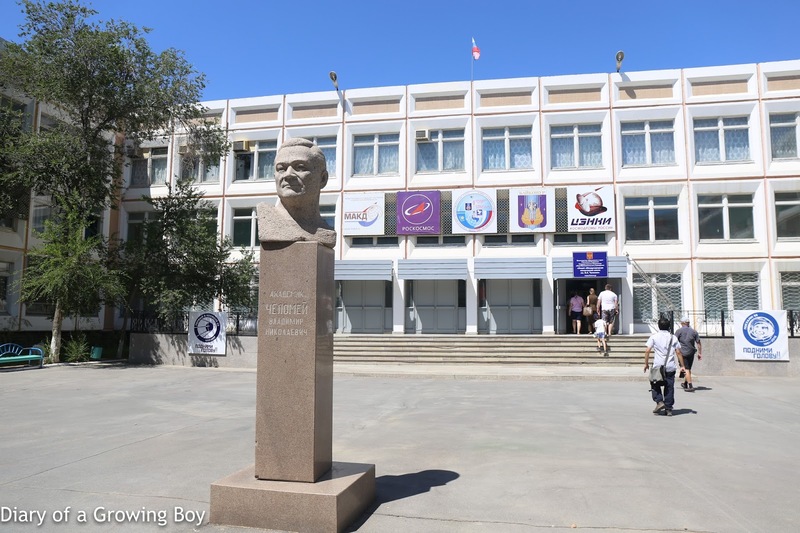 This is a secondary school for children who live in Baikonur, and it's clear that the curriculum is geared towards the space program. Interestingly, the male/female ratio is roughly 50/50 here. Lots of artifacts from the space program are displayed within the school, including used space capsules. 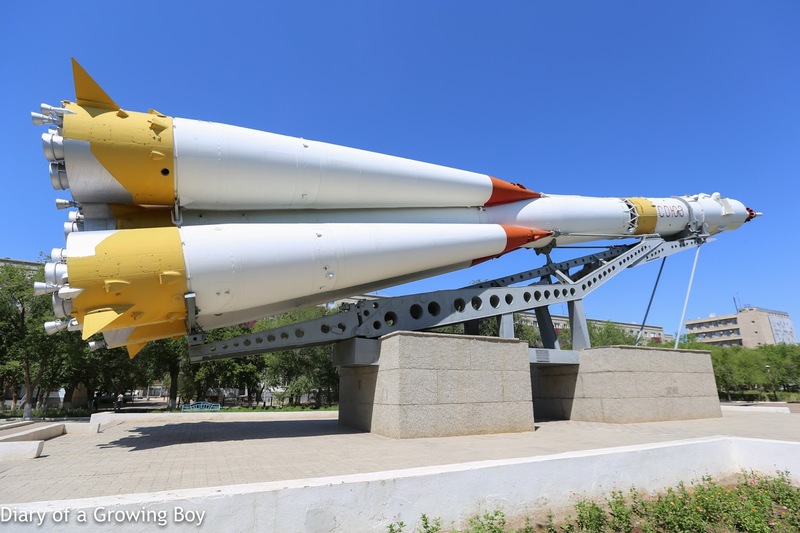 Children have competitions to design and build rockets, and the top student from each graduating class has a choice to go to any technical university in Russia. 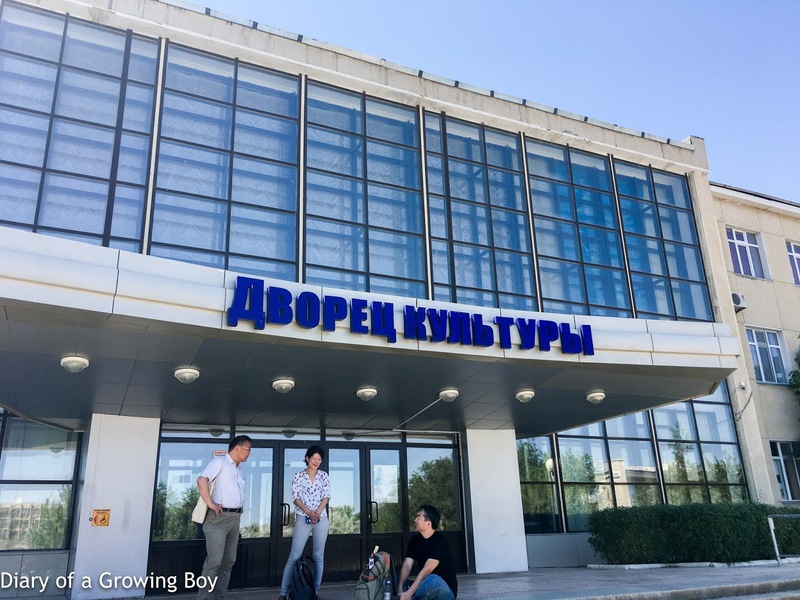 Many who graduate end up coming back to work at Baikonur. 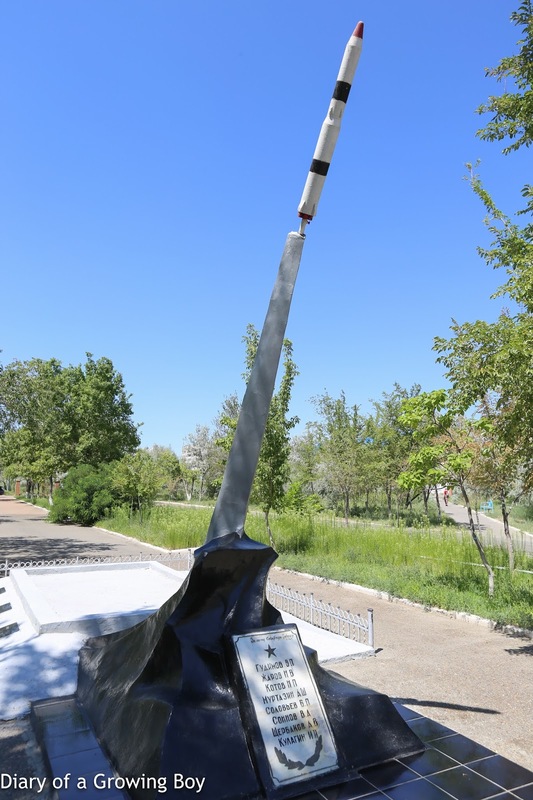 At the end of our tour, a couple of us even got to launch a rocket. 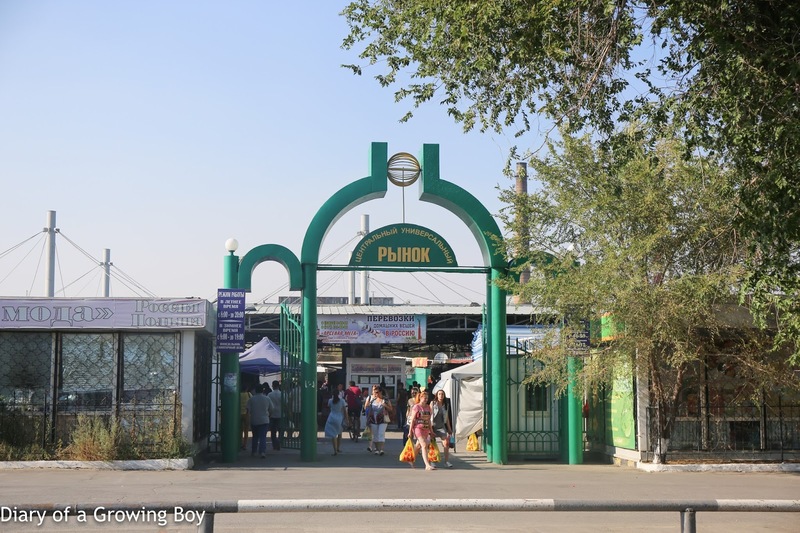 Our last stop of the day was the Central Market (Центральный рынок). 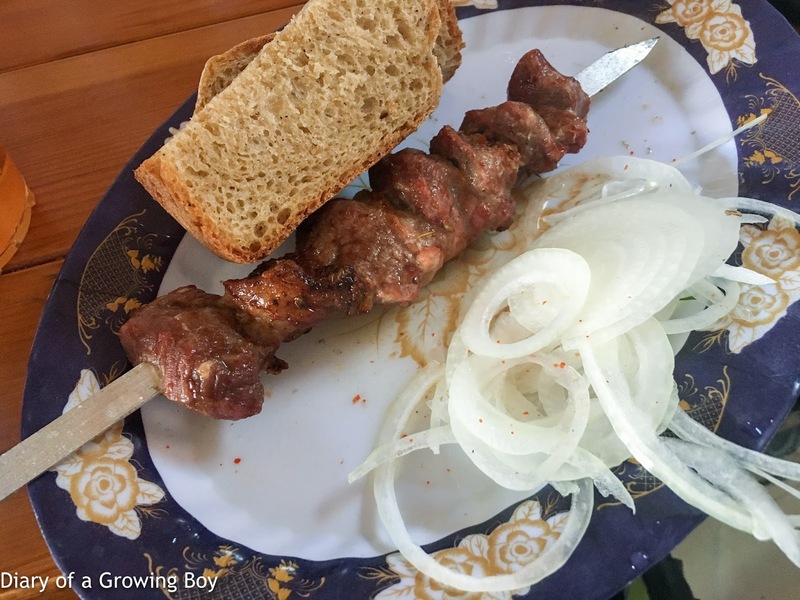 We were meant to explore and go shopping, but some of us decided to find a spot for a beer and some mutton shashlik. 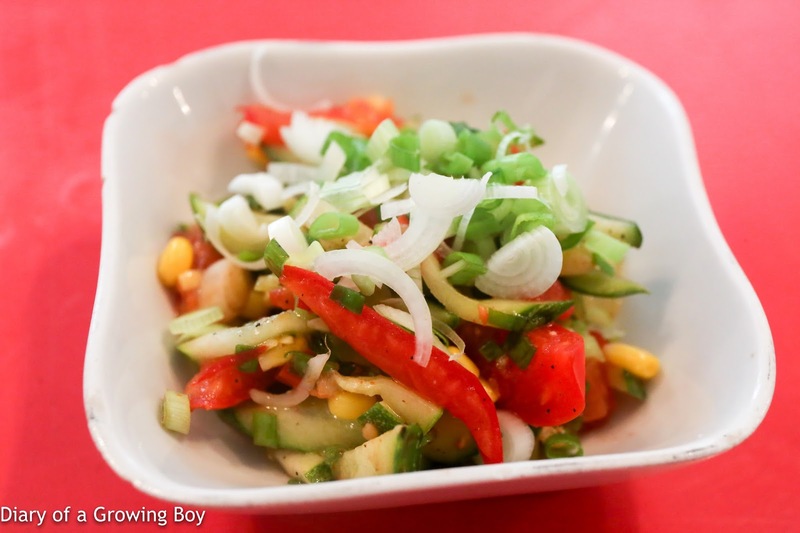 I started with the tomato, cucumber, and onion salad, which also came with corn and spring onions. 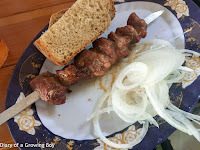 For main course, I was left without much choice as the other option was no longer available... so I took this dish known as "bits of Selyanski" (биточки по селянски), which in this case was a minced beef patty, served on rice with pan-fried egg. 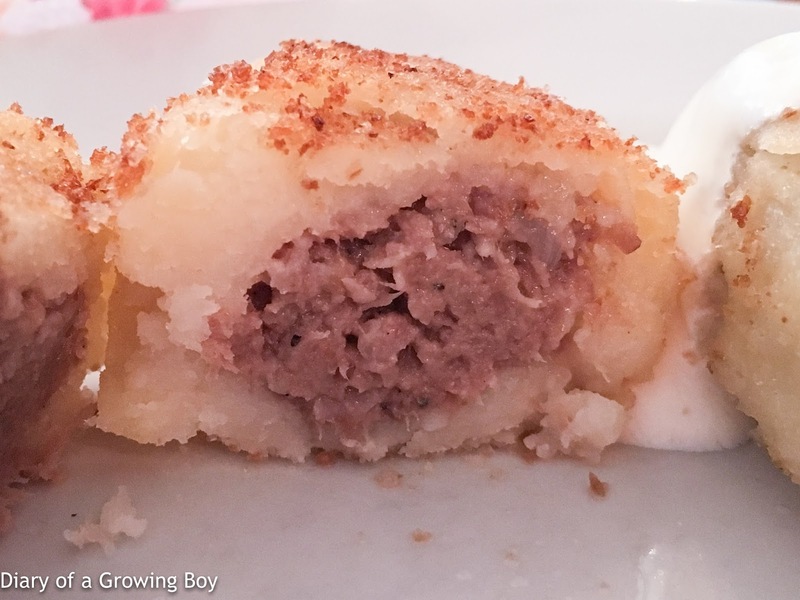 The beef patty was OK and came with a thin layer of mashed potato on top. The rice, however, was a disaster. 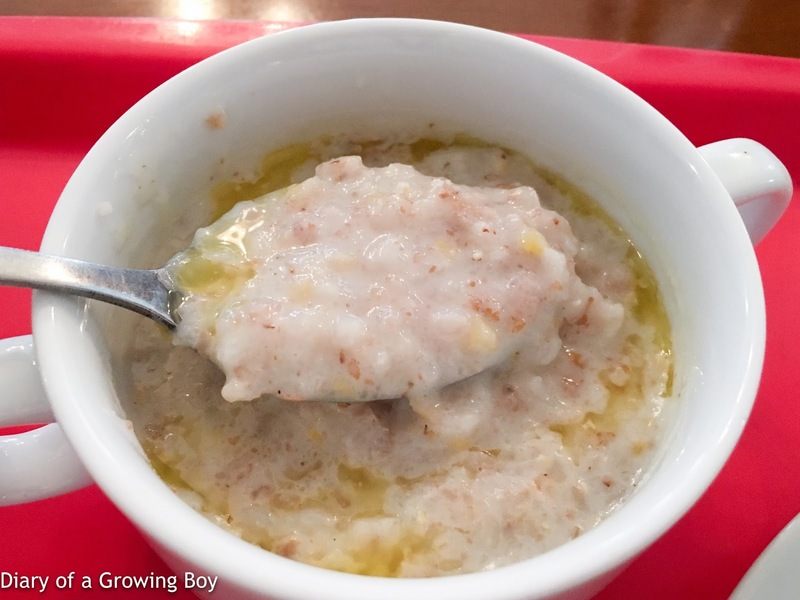 It was completely mushy and there seemed to be no seasoning. Not happy with the lack of choice, I spotted bags of frozen dumplings next to ice cream cones in a freezer. 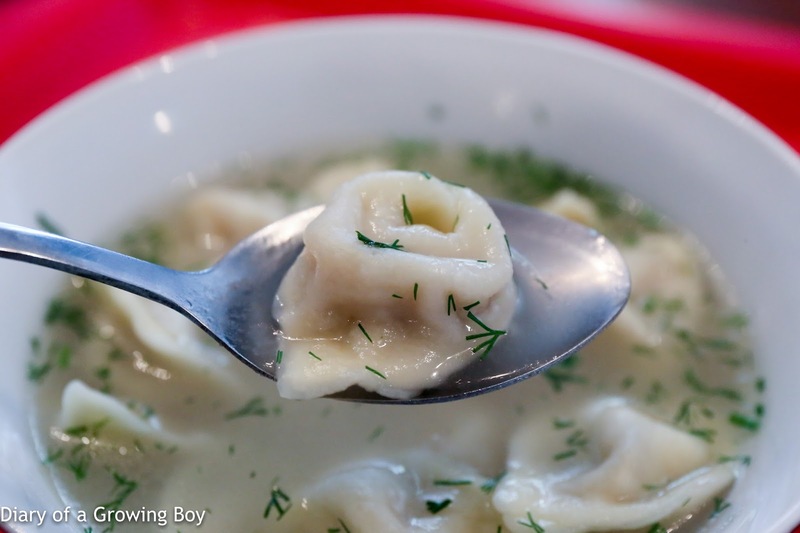 Our tour leader Aleksander checked and amazingly, the kitchen agreed to cook them for us, so I asked for the dumplings in soup. Beef and pork dumplings (Пельмени из говядины и свинины) - actually, I was much happier eating these dumplings than the mushy rice I had just eaten. Love the liberal use of dill. Just before turning myself in, we were visiting by a pack of camels on their way home.